Welcome to our first Tulu lesson. I am not a grammarian, but I feel it’s better if I started with few grammatical terms rather than giving a bunch of sentences to you. Before we start, please visit the page "How to Pronounce" to know how to pronounce Tulu words in Roman script. Today we are going to learn some of the nouns in Tulu. Nouns identify people, places, things, and ideas. Eg: appae - Mother, amme - Father, ill - house, Uru –village, sudae - river, mara – tree, bolpu – light, kaDal – sea, porthu – time, sAlae – school, bElae – work etc. Masculine nouns: All the male names and nouns of relationship eg: rAme - Rama, karNe - Karna, amme – Father, AN – boy, palaye – elder brother, megye – younger brother, mage – son etc. Feminine nouns: All the female names and nouns of relationship. Eg: Seetha, Kaveri, appae – Mother, poNNu – girl, pali or palidi – elder sister, megdi – younger sister, magal - doughter etc. All the above words are in singular. 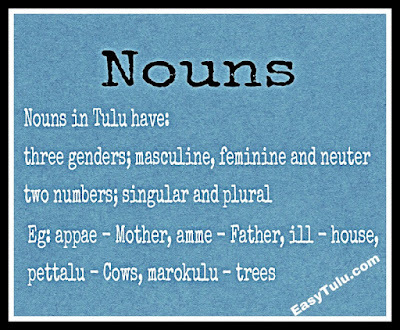 To make it plural, we have to add one of the suffixes lu, kulu, er or allu. 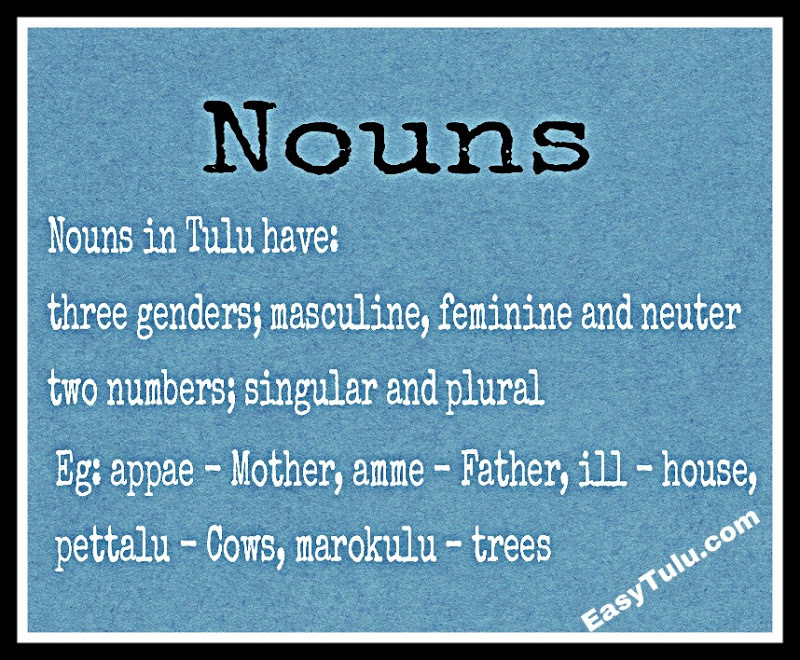 lu and kulu – used for making plural nouns eg: ANulu – boys, poNNulu – girls, erukulu – bulls, pettalu – cows, illulu – houses, Urulu – villages, sudekulu – rivers, kADulu – forests, nAyilu – dogs, puchchelu – cats, pakkilu – birds, janokulu – people, marokulu – trees, pilikulu – tigers, pUkulu – flowers, bAlelu or jOkulu - children. er – used for giving respect to someone. Eg: dEver – god, ammer – Father, apper – mother, rAjer – king, rAmer - Rama etc. This type of words can be pluralized again by adding ‘lu’ suffix. Eg: dEverlu – gods, rAjerlu – kings etc. Apart from this, 'er' also used to make plural adjectives. Eg: Tuluver - Tuluvas, buddhivanter - wisemen, kalver - thieves etc. allu (originally aDlu, but in present Tulu it is pronounced as allu) – used to make the nouns of relationship to plural. Eg: appaellu – mothers, ammallu – fathers, palayallu – elder brothers, megyallu – younger brothers, paliyallu – elder sisters, megdiyallu – younger sisters, magallu sons, magalallu – daughters etc. 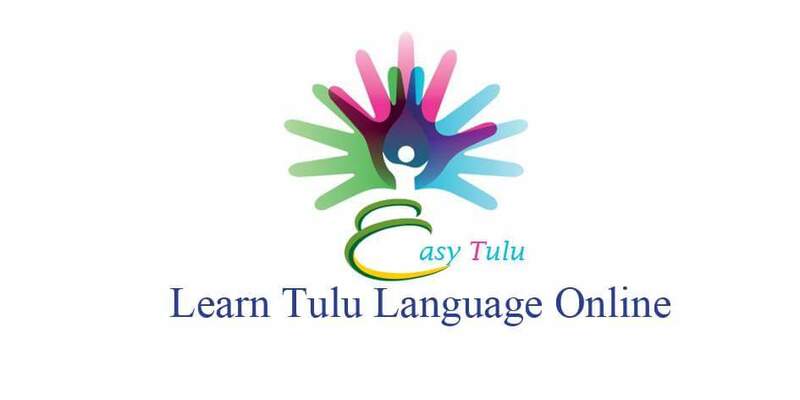 Tulu has 8 cases Nominative, Accusative, Ablative or Instrumental, Dative Genitive, Locative, Communicative and Vocative. Next week we will learn some pronouns and later I will give you sentences on each case. Please give me your feedback. Thanks! "Gudded Bhoota Undu"....here does it mean "There is a demon in the hill" ? Would it be correct to say "Guddelena Mele Bhoota Undu" to say "There is a demon on the hill" ? Yes, guDDeD bhUta uNDu means there is a demon in/on the hill. guDDelena means ‘of hills’ (guDDagaLa in Kannada), but is not used in conversation. Mele is a Kannada word, Tulu equivalent is mitt. So you can say, guDDeda mitt bhUta uNDu (guDDada mEle bhUta ide) - There is a demon on the hill. shouldn't bhoota means spirit in english,whenever we use word bhuta it is to say spirit, demon is called as rakashe or rakshashe.why use word devil for bhuta? shouldn't bhoota means spirit in english,whenever we use word bhuta it is to say spirit, demon is called as rakashe or rakshashe. why use word bhoota for devil ? "jepp eete..mast pathervaa" means what? "You have gone it seems"